A guide from 0 Hz to 30 EHz (DC to Gamma rays). The main bands, all frequencies in MHz unless otherwise stated. With grateful thanks to OFCOM (previously the UK Radiocomms Agency) for so openly publishling all you need to know... even if actually tuning in to anything other than Broadcasting/CB/Ham is not allowed, that's the rules, folks. Which is why there are no details of Private systems here... this page details frequency ranges and channel schemes that could be used for various services, but not actual, specific instances - unless the details are so commonly available elsewhere that they can't be considered secret. OFCOM themselves are now making licence details public, so the PMR bands usage is now public domain. As recommended by Short Wave Magazine (UK) - "Excellent... well worth a look"
Established in 1997 - 15 years already! DISCLAIMER: This page is provided for interest/curiosity only. Private services should remain that way, if you listen without a licence (you can't get them) to anything other than licenced Broadcasting or Amateur Radio (& CB) you are breaking the law. Even having a private frequency stored in a receiver's memory channel is considered to be proof of intercepting messages that are not intended for you. Penalties include heavy fines and/or imprisonment. Under Section 5(b) of the Wireless Telegraphy Act 1949 it is an offence to use radio equipment with intent to obtain information as to the contents, sender or addressee of any messages, whether or not the information is passed on, which the user has not been authorised to receive. PLEASE COPY THIS WEBPAGE TO YOUR PC FOR SAFEKEEPING, in case this website vanishes. HINT: There is a glossary at the end of this page to explain all the funny acronyms! So what's the point of this page? Personally, I've been fascinated by the magic of radio all of my life, fiddling around with radios since primary school, and over the years having read a fair bit about communication systems and the radio spectrum, I've now got a lot of radio information rattling around in my head. I thought it would be nice to share it with the world, via the web, to show what a crowded resource the RF spectrum is; how every nook and cranny is allocated to some service or other; how OFCOM has to balance the needs of various services when they are asked for more spectrum. Also, with all that RF energy passing through your body, don't you think you have a right to know exactly what sort of emissions are zapping through you? (I'm not saying you have a right to know the content of the messages, only the nature of the delivery). Also, Amateurs should be aware of the services that could be affected should their equipment not be up to the required standard. Likewise to anyone foolish enough to consider operating an unlicenced pirate station - just don't - there really isn't any point is there? And lastly, because published books are often out of date or plainly wrong in these matters. Here then, is my quick tour of the spectrum of 2012, with links to other sites where appropriate. Broadcasting - LW,MW,SW, 87.5-108, DAB, TV, you're invited to listen (there's money in it, or a license fee to justify!). Aeronautical - "airband" - HF, 108-137 MHz. You may not listen, but it seems to be tolerated. Maritime - HF, 156-163 MHz. Probably tolerated, but no listening unless licensed, and on-board. Low Power / Short Range Devices - Cordless telephones / headphones / microphones, remote control etc. c) Links - mobile "programme audio" back to base, or Fixed links between sites. Like the military and many low-power devices, they seem to crop up all over the spectrum! However, some of the assignments in shared bands (mainly BBC) are to cease in 2000, leaving mostly primary bands. As Bands I, III, IV and V are designated BROADCASTING it seems logical that broadcasters may also use these bands for mics and comms either at UHF on locally unused "in-band" channels, or (also for links) in the VHF bands that are no longer used for broadcasting. Around 174MHz is very popular for mics, as well as other parts of Band III that coincide with French TV carriers and so are not used for PBR. Note that JFMG also deal with Special Event short-term assignments for local comms, e.g. Ascot.
. On-site shared - dual "C2" or single "O5" - 3km range max., why not use PMR446?! Which explains why that "spare channel" can't be used for anything else in your area! Given that the number of users of PMR channels runs into tens of thousands ( 2003 report and 1997 report) , it would be quite futile to attempt to list them all - it amazes me that publications even try. Even worse, once a frequency/user tie-up makes it into print, no-one ever seems to doubt its validity and it's often printed way after it ceased to be used! Fair enough to list national allocations, the general type of use for a channel - but to try and find EVERY assigment, EVERY taxi firm.... ho hum. Military - various web pages will show that there is a world market for equipment operating in the bands such as HF, 30-87.5 (25kHz FM), 116-155 & 225-400 (25kHz AM), 470-512 etc. Note that whilst the odd Combat Net here and there may be "in the clear" any serious tactical use would be very hard to find. Frequency hopping and scrambling are used - after all, would you want your country defended by forces that could be easily monitored? Operational use (like PMR) for base security, training, Mil. Police, MOULD etc. involves fixed frequencies, and various books show that Low VHF, Low Band, Mid Band, 406.1-420 and UHF1 are heavily used for these purposes. 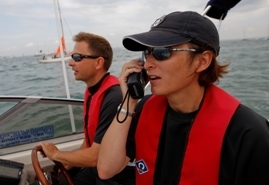 There is currently a general move from VHF to UHF, and the use of a TETRA system is being considered. This type of radio traffic is still not to be listened to! Public Telecomms - paging, mobile telephone/data - the reason why scanner manufacturers HAD to include coverage of the 900MHz band (! there's nowt else up there to listen to). Eavesdropping on analogue mobile calls is quite rightly frowned upon. Home Office for the Emergency Services - previous versions of this document did not mention these allocations, but as the bands are shown on OFCOM pages, and in various books, some are now included for the sake of clarity. Only the BANDS are shown, not actual frequencies in use. Do NOT listen in! NOTE 1: Boundaries - a "equals" symbol (=) is used here to clarify a known boundary between two band sections, this usually means no transmissions on the frequency itself, but that use of the band includes RF emissions up to that point. This could be a point between two normal channels, such as the 165.04375 boundary between the last mid-band channel 165.0375 and the first high band channel 165.050, or even a "wasted" channel giving "guard band" separation between two types of service. One exception is the international marine 156.0 boundary - used for channel 0 uniquely in the UK, which isn't at odds with the 154-156 use below I guess! The RA/OFCOM usually specify bands as boundaries - hence I try here to show actual usage. NOTE 2: Dots after a frequency signifies the start of a range, whereas a single spot frequency has no trailing dots - although this doesn't apply in the two-column section. Frequencies given relate to the center of the transmission (COFDM, FM, AM) (i.e. the unmodulated carrier with carrier-based systems such as FM/AM), or the absent carrier for SSB. NOTE 3: Scanner folk often use the terms Simplex and Duplex wrongly to describe Single and Dual frequency systems. The term Simplex means taking turns to transmit, whether on one or more frequencies. The proper terms to use are S.F.S. (Single Frequency Simplex) and D.F.S (Dual..). Duplex only applies on telephone style systems where one party can interupt the other. Even TT (Talk-Through; repeaters) is still simplex. I use the abbrev.s Single and Dual. Any time I specify "Split" generally implies D.F.S., and details are given as base freq.s, with the change in frequency in +/- MHz needed to hear the mobile. Even "Duplex" doesn't neccessarily mean two frequencies, new digital systems can rapidly take turns on the same freq. by time-compressing the audio data-stream! S.F.S. and TT (repeaters) are obviously very easy to monitor with just one memory (or in manual mode) and "scan delay" isn't a problem - the longer the delay the better, as many radio users seem to need a few seconds to think of a reply (TT "over" pips are generally a waste of time, most dimwits wait for the squelch crunch). This means conventional scanners are fine for monitoring amateur, CB, airband, ship-shore-ship, some PMR etc. These difficulties could be quite easily overcome if the manufacturers thought just a teensy bit harder about the operation of their receivers. By the time they DO get such advances implemented, everything will be digital anyway! "The -60 or -70dBc bandwidth is approximately twice the Carson bandwidth." The modulation index is defined as the peak deviation divided by the highest modulating frequncy. "This would be 5/3 for NBFM and 2.5/3 for the really narrow stuff. Modulation indexes under 1 don't really work that well, 5/3 is almost 2, and broadcast FM uses 75/15 or 5. It depends on the type of Signal-to-Noise Ratio you need." Note also that true FM uses pre-emphasis per octave from 300 to 3000Hz - which matches the effect of Phase Modulation. overcoming the additional noise getting through the wider receive filter. DMR tier 3 is a trunked system under development. but FM modulated as GMSK. 0 Hz No cycles per second - let's call it DC! between 2 and 7 milliHertz. We are talking of cycle lengths of several minutes here. 30... High Beta - Paranormal powers! phones it's filtered out. Hence too the 3kHz channel spacings on HF. 0.019 FM stereo "pilot tone"
the oceans (for submarines) but the antennas need to be rather large, or magnetic loops. used to be 200kHz(1500m) until Feb 1st 1988... ex BBC R2 ex Light Programme ex National Prog. For as long as the remaining few valves last, then it will go silent! Europeen Broadcasting Area for LW and MW ... "a few hadn't moved even by 1964 (MW)"
the channels were changed to be multiples of 9, so the LW all moved down 2 Khz. thus 908 (then the BBC Radio 4) became 909 (now 5 live)"
February 1988 and the top end in Feb 1990. Atlantic 252 launched on 254 kHz in Sept 1989"
Most channels were 9 kHz spaced, on a frequency which was a multiple of 9 kHz, minus 1 kHz. For example, London Radio 4 was 908 kHz, Radio 3 was 647 kHz, and Radio 1 was 1214 kHz. There was one 10 kHz spacing at the bottom end: 539 kHz (normal pattern), then 529 kHz. get one extra channel when the top end of the band was extended from around 1550 kHz to 1606.5 kHz. The frequencies were 1538 kHz (normal pattern), then 1546, 1554, 1562, 1570, 1578, 1586, 1594, 1602." Light Prog was Forces Prog (1940) renamed for peacetime. R3 from 647kHz to 1215/247 "3rd Programme was on 464m (647kHz) from 1951"
1922: BBC opened the first regular public broacasting station in the world on 14th November, London. 1926: 25kW LW station opened at Daventry on 187.5 kHz (1600 metres), October. 1926: On 14.Nov.1926, first of many international re-plans, extending to 1200 kHz, with 10kHz spacing. 1929: 2 re-plans, 13.Jan & 30.June - extended to 1500 kHz and abandoned 10kHz channel spacing. Frequencies allocated to countries instead of to individual stations. 1950: March, new plan extended MW from 530 to 1600 kHz. 0.500 Calling, Distress (CW) from 1906 until near turn of 21st century. WRC-12 reallocated to nav use. See the British DX Club's Lists. Channels internationally assigned to countries with maximum power levels specified. plan (Geneva, 22.11.1975) exists anywhere on the web, do let us know! the bell on the front. Frequency again was around 2 megs and it is the 1930s. 'X-codes' well into the 1980's." --2.85=---HF-------------------- the "real shortwave bands"! mobile, fixed, military, ISM, SRD, and... "numbers stations"
at 2.5, 5.0 (Rugby), 10.0 (Rugby), 15.0, 20.0, 25.0 etc. whereas Aero has the "odd MHz" 3,5,9,11,13,15 etc. 6526- 6682 NATS: 6622 BT: 6634 +EC! Watch for "Airfield colour states" every hour at the same minutes past the hour. 3023 - 3152 3023 SAR (night) and up to 3230= ? 8965 - 9037 9031 "On-the-hour" and H+30 "Architect"
I presume "fixed" on its own means mobile so long as one station is fixed! 13800=-14000= Fixed + all Mobile + EC! o Cadets - CCF etc. Equipment they use tends to read 2kHz higher - 5330 etc. "Echo Charlie" band at 6.6MHz (please let me know what EC means!) has been around for decades. some do venture down as far as 6530 but "most don't really go below 6635" has been heard. International flight control may be affected. There may be a dozen or more QSOs at any time! 3430 - 3500 86 or 85m, LSB/USB calling 3475 LSB much aero use... SAR on 3488 etc. 6530 - 6700 45 metres, LSB/USB calling 6670 LSB Italy 6660 Sweden 6685 military above 6682! 18010 -18050 16 metres, USB/LSB calling 18030 USB stay above 18030, it's military aero below! 20900 -20980 14 metres, USB/LSB calling 20930 USB I'd stay below 20960, if I were you. 26185 -28000 11 metres, USB/LSB calling 27555 USB CB "Freeband"
like VHF/6 metres - services intended to be local, rather than long-distance. 26 (25?!!) to 28 MHz littered with freeband unofficial CB channels. Very nicely operated SSB DX, putting Amateur radio to shame! that they would be opposed to introducing AM/SSB CB operation." in 1996. These CEPT channels are the original USA freqs, known as the "mid" channels, or EU. 27.265 26 +27.270 "Blue/Grey" or sometimes "White" (26a) or even purple! 27.405 40 27.315 31 Calling? use up to 28MHz. Model control on 27.255 was inadequate and shared with all sorts of paging. to pirate channels 22A and 22B in the Business Band that couldn't yet be used for CB. UK with channel 25 now being "Blue" (27.245) and channel 02 now "Black", amongst other interleaved channels. extra sets of 40 channels such as "hi" and "lo", including the gaps and sequence jumps! 26.957 to 27.283 is still an 11m Amateur band in New Zealand! Around 2000 I wrote: "CB should be license-free! Wakey wakey, UK! it - licenses can be revoked. Interesting issue. Maybe a license should be for life... (unless forfeited)." and Europe, permitting SSB equipment (12W PEP) within band 26.96-27.41 MHz (the EU 40 channels). Preferred date for implementation by national administrations is October 1, 2011. OFCOM have said they are likely to work on this after 2012 Olympics. Callers announce the freq they'll move to, usually between 27.41 and 28MHz in 5kHz chs. Very civilised! like CTCSS, or (even better) a 460 MHz system as they do in the USA, Australia etc. NOTE: (oct98) it looks like PMR 446 will do nicely, apart from the low power. although getting onto HF legally is now far more simple. users of 27MHz I would say CTCSS is needed. I can't see 11m SSB stopping yet! to base/mobile sets with external antennas and a couple of Watts of power. with the remaining channels used for simplex. or Single Channel (AM/FM voice/data) with +/- 5 or 10 kHz shift - effectively 5kHz steps. On rare occasions ion layer conditions allow the reception of these signals over the Atlantic into Europe. 40.665, 40.675, 40.685, 40.695 Baby Alarms, etc. There was a pre-war (1928) 56MHz ham band, and the 5m band (58.5-60) for three years post-war. 50=... Amateur Radio 6m band, to 52= (varies in other countries). Primary (51-52 secondary). Various countries overseas allow FM broadcasting from 65-74 and 76-87.5 (eg OIRT), this often reaches us. 75.0 CAA ILS runway marker beacons (Guard band 74.8-75.2) 200ft, 1 & 3.5 miles from touchdown. From 1950s. later telephony - until VHF move, 1947. 80.25-80.3875 used by ROC/WMO in 1980s, fairly clear ever since?